Leading Ladies: Connecticut, Louisville Set For Championship : The Two-Way Connecticut fended off Notre Dame 83-65, and Louisville triumphed over California. The two winners will play in the women's NCAA title game on Tuesday. Breanna Stewart of the Connecticut Huskies reacts to a 3-point shot against Notre Dame during the NCAA semifinal game Sunday. UConn won 83-65. Connecticut has been to the women's NCAA championship round twice in the last five years. In 2009, they were up against Louisville. Connecticut beat Notre Dame 83-65 in the Final Four round Sunday night, clinching its ride to the title game. 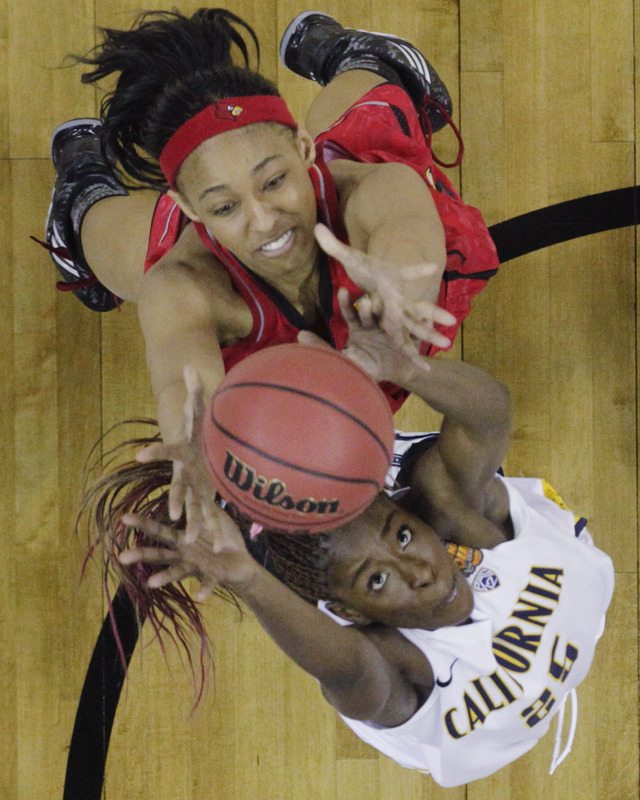 Earlier, Louisville rallied a comeback against California, ending at 64-57. "Notre Dame has beaten UConn three times this season by an average of three points — although the largest margin of victory, a six-point victory in South Bend on March 2, came in triple overtime." It was not to be Sunday. 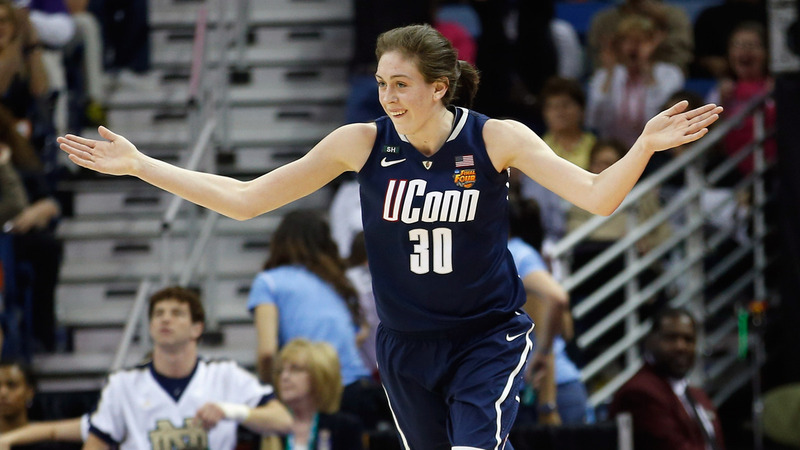 UConn's Breanna Stewart scored 29 points. By halftime, Connecticut had a 10-point lead. California forward Gennifer Brandon (No. 25) and Louisville forward Cortnee Walton (No. 13) go after a rebound in the second half of a national semifinal game Sunday. It was a surprise either of them made it. California, which was playing its first Final Four, lost to Louisville. Louisville had already brought down top teams Baylor and Tennessee earlier in the women's NCAA college basketball tournament. "After opening the game with one of their best halves of the tournament, the Bears (32-4) saw their double-digit lead evaporate in the second half." "Her shooting really kept Louisville close when nothing else was going right because Cal was controlling the boards, they were controlling the tempo. When the game got tight in the second half, Cal committed several turnovers on successive possessions. That let Louisville back in the game." SB Nation called it "one of the best games" of the women's contest this year. Tuesday, Louisville will go on to play the winner of Sunday night's UConn-Notre Dame matchup. It will be the Cardinals' first time back in the title game since 2009. Oh, and Louisville also made it to the top of the men's tournament. They face Michigan Monday night.